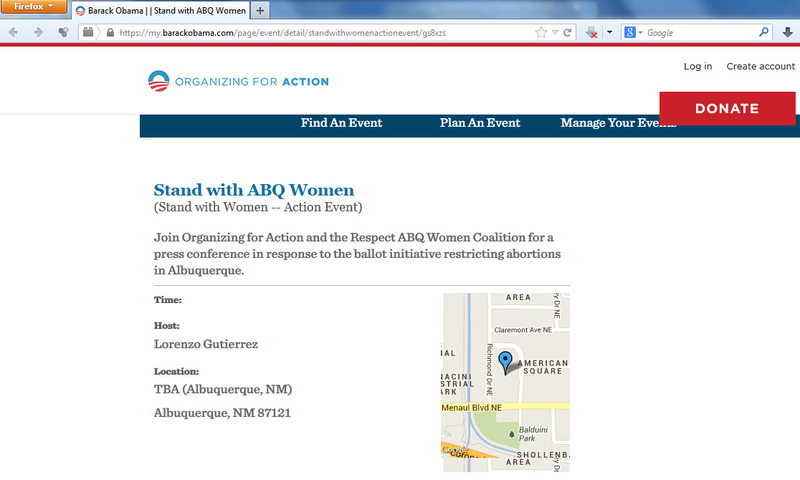 Albuquerque, NM – Operation Rescue has learned that the pro-abortion Respect ABQ Women Coalition, which is the main opposition to the Albuquerque “Pain Capable Unborn Child Protection Ordinance,” is actually an affiliate of Pres. Barack Obama’s “Organizing for Action,” which encourages activism for radical leftist causes. The two groups are working together under the banner of “Stand With Women,” which is coordinating a national effort against the municipal ordinance through BarackObama.com. 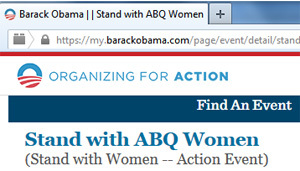 Operation Rescue received a copy of an e-mail concerning a “Stand with Women” national conference call held on October 24, which originated from Kelli Lamb, Barack Obama.com, who is the Women’s Issues Coordinator for Obama’s Organizing for Action. During this “strategy call,” Jennifer Lawson, the field director for the Planned Parenthood Action Fund in Albuquerque, solicited funds and volunteers to oppose the late-term abortion ban, according to a pro-life supporter who debriefed Operation Rescue after listening in on the call. As a Senator from Illinois, Obama favored the now outlawed “Partial Birth Abortion” procedure and has been a rabid supporter of unrestricted abortion. The Pain Capable Unborn Child Protection Ordinance, which was placed on the ballot through a grassroots Direct Legislative initiative with signatures of 27,000 signatures of Albuquerque voters, is set for a city-wide vote on November 19. If successful, the initiative would ban abortions after 20 weeks of pregnancy. A recent Albuquerque Journal Poll shows 54% of likely Albuquerque voters support the ban. A similar provision in Texas was ruled to be Constitutional by a Federal Court judge just yesterday. Archbishop Sheehan will also celebrate a special mass at The Shrine of Saint Bernadette, 11509 Indian School Rd. NE, Albuquerque, NM 87112, on November 3 at 5:00 p.m. to highlight the importance of the November 19th vote that will save thousands of innocent lives. Read the Project Defending Life Press Release that includes a statement from Archbishop Sheehan. To learn more, visit LateTermAbortionBan.com. Albuquerque, NM – In just under 30 days, Albuquerque will be the first city in the country with the opportunity to vote to ban late-term abortions starting at 20 weeks of pregnancy. That vote is more important than ever in light of new research that reveals New Mexico’s taxpayers pay for hundreds of abortions each year that are halfway though pregnancy and later – often at the encouragement of the abortion providers themselves. New Mexico is one of 15 states that uses taxpayer money to fully fund abortions. In 2011, taxpayers funded 1,786 abortions through state Medicaid to the tune of over 1.1 million dollars. 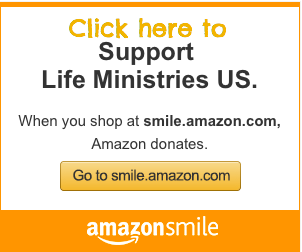 “While we rejoice in the decreased number of abortions that taxpayers are funding, it is disturbing that the vast majority of these expensive abortions are done on babies over 17 weeks gestation. Should the Pain Capable Unborn Child Protection Ordinance pass in November, it would save hundreds of lives each year and would save the taxpayers millions of dollars,” stated Bud Shaver, spokesman for Project Defending Life. Two out-of-state abortionists who fly to Albuquerque on alternating weeks performed most of Medicaid-funded abortions in New Mexico. California resident Shelley Sella performed 201 of the 649 tax funded abortions, earning $51,328.63 profit. California resident Susan Robinson performed 184 tax funded abortions for a big $47,555.01 paycheck at tax-payer’s expense. The upcoming election to ban late-term abortions in Albuquerque prompted a recent undercover investigation by members of Project Defending Life to find out how much an abortion at 20 weeks costs New Mexico taxpayers. That investigation discovered that an abortion at 20 weeks gestation at the UNM Center for Reproductive Health (the University of New Mexico’s freestanding abortion clinic) costs $1,200. At Southwestern Women’s Options, the largest late-term abortion clinic in the U.S., women are charged $1,850 for each 20-week abortion. At both abortion clinics, the price of abortions rose dramatically with each passing week of pregnancy. The recorded phone conversations with both abortion clinics showed employees encouraging a prospective patient to use Medicaid to pay for an expensive 20-week abortion, even though on one case, the caller indicated that she had a “good job” and did not believe she would qualify for the program. Operation Rescue has published two videos featuring the undercover recordings made by Project Defending Life. 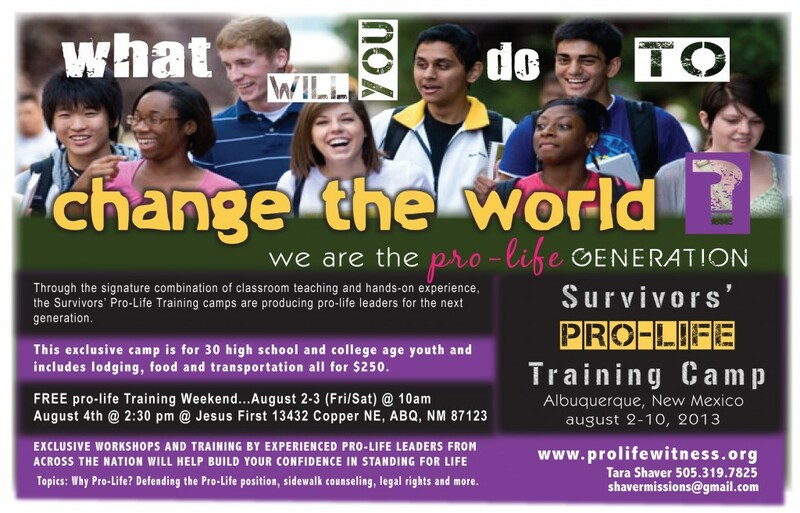 The Survivors New Mexico Pro-Life Training Conference kicks off with a Q and A session with Pro-Life Missionaries to ABQ Bud and Tara Shaver. They talk about how they got involved in the pro-life movement, what brought them to Albuquerque, and what they have been up to over the past three years since moving to ABQ. Jeff White, Founder and Director of Survivors shares his vision for the ABQ Public Awareness Campaign and Protest and how through the power of Jesus Christ, we will “Bind up the Strongman and plunder his house to take his most prized possession”…the babies scheduled for death.